IAD (Instructor Assisted Deployment) Parachute Course - Jump 2/3 or 4 (pay per jump option). IAD (Instructor Assisted Deployment) Parachute Course - Jump 5 First Freefall (pay per jump option). 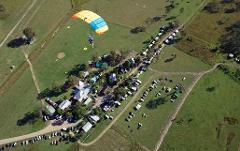 IAD (Instructor Assisted Deployment) Parachute Course - Jump 6/7/8/9/10/11/12/13 or 14 (pay per jump option). IAD (Instructor Assisted Deployment) Parachute Course - Jump 15 Check-Out jump with instructor (pay per jump option).